The seasonal cycle of river ice growth and decay has much in common with that of lake ice, but there are some important differences in the thermodynamics and the character of the ice. The flow of water creates some complexities. Because rivers are shallow and well mixed, the water throughout a reach of a river must cool to 0°c before it will begin to freeze (unlike lakes, in which freezing begins when much of the water column is at 4°C). Turbulent heat dissipation and conversion of potential energy to kinetic energy as a river flows downhill provide internal sources of energy that help river water to resist freezing. It is therefore common to see ice along the edges of a river and a coating of frozen spray on vegetation surrounding the river while the main channel is still flowing freely well into the winter. Once nucleated, ice floes on a river advect downstream, so there is generally a mixture of open water and ice cover during early stages of freeze-up. Ice convergence in reaches with slower flows generates a more complete ice cover, and when conditions are cold enough the ice cover becomes fixed in place, anchored by fast ice that is rooted to the shore. At this stage, the evolution to fixed and complete ice-covered conditions often propagates upstream, and the ice can then thicken in place in similar fashion to the growth of lake ice. Water continues to flow beneath the ice in most major rivers, but some alpine streams and high-latitude rivers will freeze to the bed. 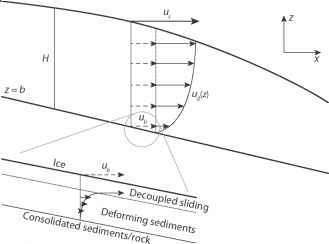 The complex channel geometry of rivers makes for large spatial and temporal gradients in ice thickness and compactness, particularly where ice cover is discontinuous. Ice can raft and ridge in the river channel or it can override the banks. River ice can also pile up, ground, and block the downstream flow, leading to ice-jam floods. Such floods can be sudden and extensive, overriding the high-water levels of "normal" spring freshet floods in high-latitude rivers. Ice-jam floods often occur where rivers widen and shallow, although they are notoriously difficult to forecast. River ice is unpredictable and hazardous during breakup, with shifting and overturning floes and frequent "surges" of ice from upstream. River ice has other capricious characteristics, particularly where fast-flowing water suppresses freezing. Water can become supercooled in this situation, giving rise to the production of frazil—thin, hollow ice needles that can be found throughout the water column and are prone to conglomeration on any subzero surface that provides a good nucleus for ice. Rapids and open-water reaches of large streams and rivers can produce prolific amounts of frazil in a winter. Where this ice nucleates or agglomerates on subsurface rocks, the river bed, or built structures, it is called anchor ice. This often takes the form of flat, congealed platelets, but it can build up to large masses of ice (e.g., meters in diameter). River and lake ice have been monitored for many decades. The ice season influences transportation, recreation, weather, hunting, and other aspects of society in midlatitude and high-fatitude communities. For these reasons, there is a detailed historical record of ice freeze-up and breakup in many communities, particularly where ship navigation and ice roads are dependent on ice conditions. In recent decades, there are also comprehensive satellite-based observations of lake ice cover and the ice season. Both visible and microwave imagery offer relatively straightforward discrimination between open water and ice conditions, as well as detection of meltwater ponds. Resolution limitations as well as high-frequency variability (advection of ice floes) make monitoring of river ice more difficult. Observations of ice thickness are also difficult and sparse. Chapter 9 describes the observational record of freshwater ice freeze-up and breakup for recent decades.